Andrew Lynn Hutchens, 200 Rattlesnake Rd., McMinnville, was charged with Aggravated Criminal Trespass, Aggravated Burglary, Theft Of Property and Vandalism on Aug. 13 by Cannon County Sheriff’s Deputy Seth Perry. The deputy was dispatched to an address on Big Hill Road on that date following a report of a prowler. Upon arrival he observed three people standing beside the rear of a garage/outbuilding and a fence. One person was wearing a white tank top and blue jeans. His clothes appeared to be wet from coming into contact with grass. He was later identified as Hutchens. The two other people were identified as the homeowner and her son. The son was holding what appeared to be a white pipe. Deputy Perry told him to put it down and he did. The deputy performed a pat down of Hutchins and found a razor knife in his pocket. He placed Hutchins in handcuffs and asked him what happened. 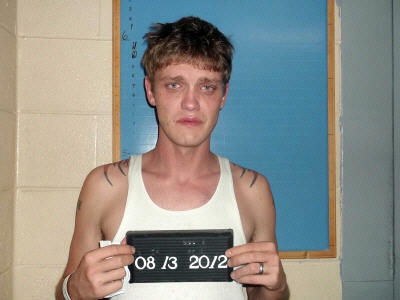 Hutchens said he was walking down by the creek and the homeowner’s son attacked him. Deputy Perry then spoke with the victims, who said they had come home from a restaurant, saw the door to the garage was open, and heard some noise. The son said he grabbed a pipe, went to look behind the garage, and saw a bag of his things on the grass. He then started walking down the hill and found Hutchins lying in the grass. He said he told Hutchens not to move but Hutchens tried to walk away. The son said Hutchens tried to take the pipe from him but he and his mom prevented him from doing so. Deputy Perry and the homeowner’s son walked down the hill and found three rubber light green gloves, a camouflage hat and a cell phone. On the way back up the hill Deputy Perry found a bag of DVDs, clothes and change jars. Hutchens was taken to jail and booked under $8,000 bond. Initial court date is Nov. 6.